Photo: Habitat of Tetradymia tetrameres north of Mono Lake. 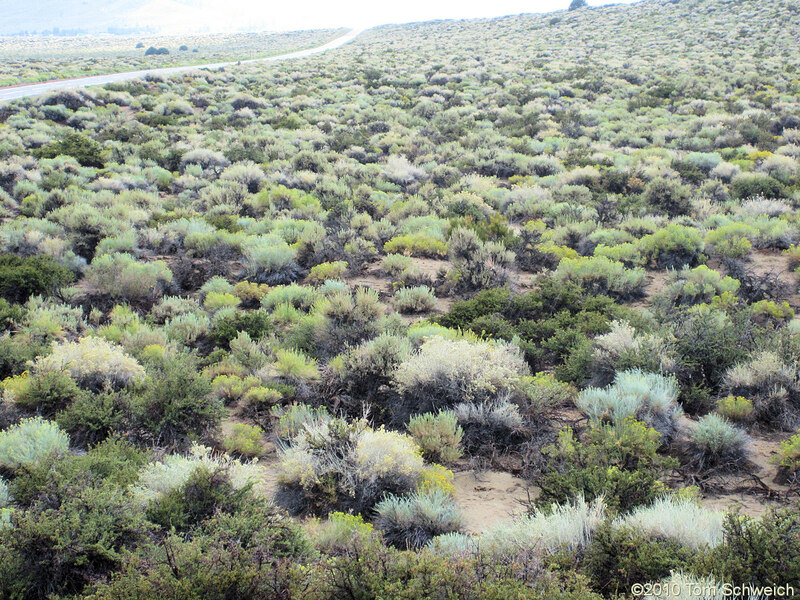 Eastern Mojave Vegetation Habitat of Tetradymia tetrameres north of Mono Lake. Photograph taken on a rainy Sunday afternoon 30 August 2010. This location is on California Highway 167, 4.2 miles east of US Highway 395, in a stabilized dune field on the north shore of Pleistocene Lake Mono. The Tetradymia is the white shrub with a little yellow on top. The sharp break in slope in the distance is a shoreline of Pleistocene Lake Mono. California Highway 167: near US Hwy 395. A Checklist Flora of the Mono Lake Basin, Mono County, California and Mineral County, Nevada. : at Mono Dunes. Other photos about Species - Asteraceae or Tetradymia tetrameres.